“We need grand houses for people who occupy grand positions.” This remark, by Napoleon Bonaparte, was aimed straight at his Foreign Minister, Charles-Maurice de Talleyrand-Perigord in 1803. When Napoleon told his people to jump, they asked “How high?” Also, Napoleon, at the time First Consul of France, was ready to help finance the purchase of a suitable chateau. So the Renaissance chateau of Valencay became Talleyrand’s new home in short order. A bust of Napoleon graces a mantel in the chateau. The “Seated Portrait of Talleyrand” was painted by Francois Gerard in 1808. The original is in the Metropolitan Museum of Art in New York, but a very good copy presides over the Blue Salon in the chateau. Talleyrand was an irrepressible ladies’ man, but his position required respectability, so Napoleon leaned on him to marry his mistress (who had once been a courtesan, but no matter). Catherine Verlée Grand had her portrait painted in 1783 by Elizabeth Vigée-Lebrun. The chateau displays a copy; the original is in the Metropolitan Museum of Art in New York. The couple drifted apart by 1816, but Talleyrand gave her enough money to live comfortably in London for the rest of her life. I’m not sure what’s going on in the portrait. Is Catherine rolling her eyes because the letter she is holding just informed her of some new exploit of her husband? It’s tempting to think so. Talleyrand was born into an aristocratic but not wealthy family. It appears he had a club foot, most likely congenital (although Talleyrand blamed it on a childhood injury). The foot brace he used as an adult is on display in the chateau. It seems that his limp never slowed him down for a minute. Talleyrand carried himself with great dignity throughout his life. Today, we’d call it “attitude. The bust above is by the sculptor Despres, 1838. And what a life he lived. His parents sent him to seminary, hoping he would have a church career as illustrious and lucrative as that of his uncle, the very wealthy and powerful Archbishop of Reims. He was ordained at age 25 and might have risen quickly through the ranks of the Catholic Church. In fact, he became a Bishop four years later. But the French Revolution changed everything. As a Bishop, Talleyrand represented the clergy, known as the First Estate, in the Estates-General of 1789. Soon he was an enthusiastic revolutionary, stopped practicing Catholicism, and was “laicized” by the Pope in 1801. (This seems pretty close to being excommunicated, but he had lost interest in Catholic distinctions by this time anyway). Talleyrand somehow escaped the deadly twists and turns of the Revolution, even when there was a price on his head. He spent some time in America, a guest of Aaron Burr. Eventually, when the dust settled, he returned to France and settled on diplomacy as a career. He soon made himself indispensable to Napoleon Bonaparte, holding high offices and cheerfully accepting the financial “diplomatic sweeteners” that came with power. He loved the perks of power, like fine ceremonial outfits. The blue-ribboned badge above is the emblem of the French Legion of Honor, the dove denoting the Holy Spirit. The magnificent document case above went everywhere with the charming and wily diplomat. The bees were Napoleon’s emblem, and the sun hearkened back to the glory days of the Sun King himself. As Napoleon lost power, Talleyrand nimbly shifted loyalties. He represented France at the Congress of Vienna in 1815, and came home with a good deal for France and a fine table for his chateau. By this time, Talleyrand had accumulated titles: Prince of Talleyrand and Prince of Benevento. He was still called back to public life at times, serving France’s restored monarchy. But he had plenty of time and money to lavish on the young woman who was probably the love of his life: his niece Dorothee, Duchess of Dino, who had divorced his nephew. Dorothee was devoted to Talleyrand, and he called her “my little porpoise.” Their relationship was scandalously “modern;” it seems they both had other lovers, but somehow it worked. The portrait above is by Francois Gerard, Public Domain. The couple hosted legendary dinners at their table, which could seat 36. Talleyrand reportedly spent at least an hour a day with his chef. The rooms of the chateau have the faded elegance of a beloved home, meant to be lived in. Floors are creaky and some of the well-used upholstery is tattered. In his old age, Talleyrand puttered around his vast estate and spent quality time reading and writing in his comfy study chair. In spite of their sketchy living arrangement, Dorothee worked to persuade Talleyrand to return to the Church. On his deathbed, he summoned a priest to give him the last rites. When the priest tried to anoint his palms, he insisted on having the backs of his hands anointed instead: the prerogative of his long-ago rank as a Bishop. He also signed a statement admitting his error in leaving the Church, so all was forgiven. Valencay is off the beaten path of the more famous Loire chateaux. In early spring, it was downright peaceful. Just down the road, there’s a fascinating motor museum, entertaining even for people without much interest in cars. Admission to the chateau includes a fine audioguide, which tells entertaining stories about the Prince. But I always buy the little guidebooks too, for the details that escape me when I’m trying to lose myself in the history of a place. Valencay is a fine place to spend even a rainy day. In sunshine, it would be even better. Join me next time for more explorations–I’m just catching up on all the chateaux I was lucky enough to see a couple of months ago! This entry was posted in Castles and Palaces, Explore Europe, France, Historic Homes, Historical Figures, Why I Love France and tagged Catherine Grand, Charles Maurice de Talleyrand-Perigord, Chateau de Valencay, Congress of Vienna, Dorothee Duchess of Dino, Napoleon Bonaparte, Prince of Talleyrand on July 16, 2018 by Claudia Suzan Carley. When Consuelo Vanderbilt did her duty and produced the required “heir and a spare” for the 9th Duke of Marlborough, she rocked her boys in a regal cradle, which is still on view at Blenheim Palace. 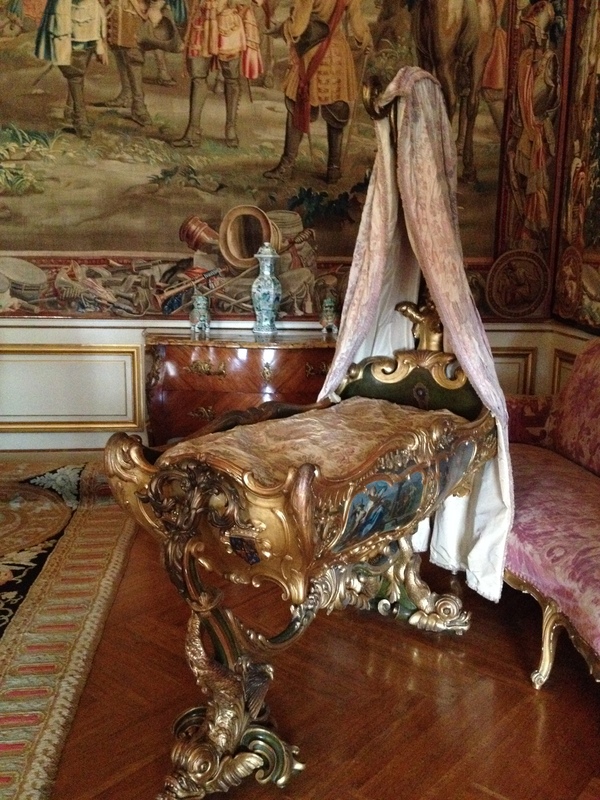 Consuelo’s mother, the irrepressible Alva Vanderbilt, wasted no time in ordering this cradle from Italy. She had moved heaven and earth to marry her very rich daughter to the Duke of Marlborough. The birth of a male heir insured that the Vanderbilt bloodline would forever have a secure footing in the British aristocracy. According to a placard about the cradle in Blenheim Palace, it was a near-replica of the one made for Napoleon Bonaparte’s long-awaited heir in 1811. I don’t see much resemblance, though. Consuelo’s cradle is ornate, over-the-top with fanciful figures and gilding. (Actually, a baby being rocked in this cradle would have gone straight over the top and onto the floor–the mattress is even with the sides. If Consuelo actually used it, she must have used it with a lower mattress). 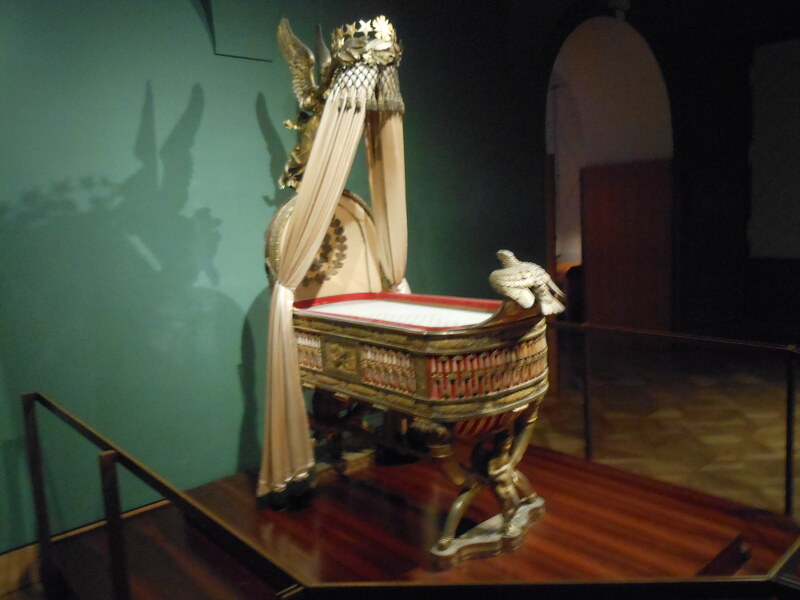 Napoleon II’s cradle is now in the Imperial Treasury in Vienna, because the child’s mother was Napoleon’s second wife, Marie-Louise of Austria. It was never actually subjected to a burping, crying child. It was a ceremonial object–a “throne cradle”– presented to Empress Marie Louise by the City of Paris. This cradle has a distinctly military look. It was fashioned of 280 kg of silver, replete with symbols of power and good government: horns of plenty, the Roman Capitoline Wolf, a laurel wreath, a crown of stars, and numerous bees. Napoleon the Emperor took the bee as his personal emblem; it was also an old symbol of Paris, indicating diligence. The foot of the cradle has a small eagle; Napoleon II was popularly known as “The Eaglet,” with the hope that he would surpass even the glorious exploits of his father. Napoleon’s only legitimate son had a short and tragic life. The Emperor made his son the King of Rome the instant he was born. Glory did not follow, though. After his father’s abdication in 1814, Napoleon II’s mother was forced to flee home to Austria with her toddler. She remained married to Napoleon, but never saw him again. The child died in isolation in Austria, where he had to be kept from the public for fear of his father’s admirers trying to rally around him. I read somewhere that the unfortunate child’s only companion was a pet bird. He was a frail, sickly child, kept indoors almost all the time. He died of tuberculosis at age 21. 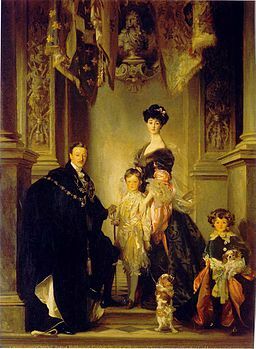 Consuelo’s marriage to the 9th Duke of Marlborough was loveless and unhappy, but her older son, in the fullness of time, became the 10th Duke of Marlborough and her younger son lived out his days as Lord Ivor Spencer-Churchill. Consuelo’s ancestors continue to occupy Blenheim Palace to this day. This entry was posted in British Isles, Castles and Palaces, England, Historic Homes, Historical Figures, Paris and tagged "The Eaglet", 9th Duke of Marlborough, Alva Vanderbilt, Consuelo Vanderbilt, cradle in Blenheim Palace, Cradle of Napoleon II, Empress Marie Louise, Napoleon Bonaparte, Napoleon I, Napoleon II, Vienna's Imperial Treasury on November 5, 2014 by Claudia Suzan Carley. I have a special fondness for a particular painting in the Louvre Museum in Paris: “La Grande Odalisque,” painted by Jean-Auguste-Dominique Ingres in 1814. The original painting was commissioned by Napoleon Bonaparte’s sister, Queen Caroline Murat of Naples. (Early Popes invented “nepotism,” installing their nephews as Cardinals. But Napoleon I took nepotism many steps further, installing family members on thrones all over Europe during the ten-year period when he was Emperor). There is something a little off-kilter about this image. Scientific analysis provided the reason, shortly after the painting first appeared in public: too much backbone. The painter Ingres defied all the known laws of anatomy and classical beauty in order to create a romanticized exotic image from an imagined Sultan’s harem. In order to enhance the sensuous curves of the woman’s body, Ingres painted this lady with at least five extra vertebrae. I guess she is alluring, if a little disconcerting. 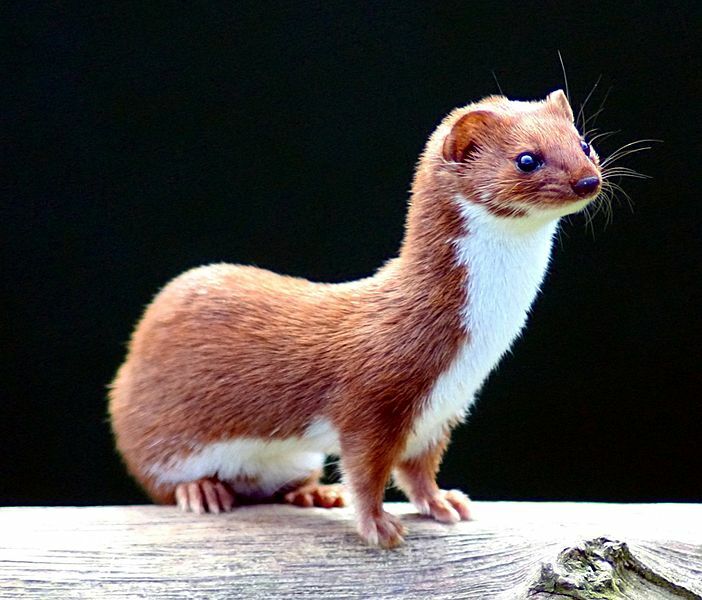 If you ask me, she looks quite a bit like a weasel. I prefer my own Odalisque, a lady I rescued from a garage sale one fall afternoon. The artist who painted this very good copy was one M. Feste, signed in red in the corner. 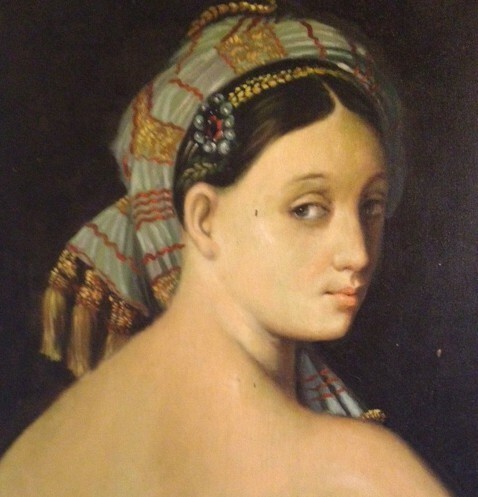 The copy shows just the Odalisque’s head and shoulder. I found her canvas leaning against a wall, in danger of being stepped on. My private Odalisque doesn’t suffer the indignity of having a ridiculously elongated backside. Now she just gazes calmly back over her shoulder at anyone entering my bathroom, confident in her exotic beauty. This entry was posted in Art, Artists, Explore Europe, France, Paris, Paris Sights and tagged "La Grande Odalisque", French Romantic painting, Jean-Auguste-Dominique Ingres, Louvre, Napoleon Bonaparte, Queen Caroline Murat of Naples on October 9, 2014 by Claudia Suzan Carley.